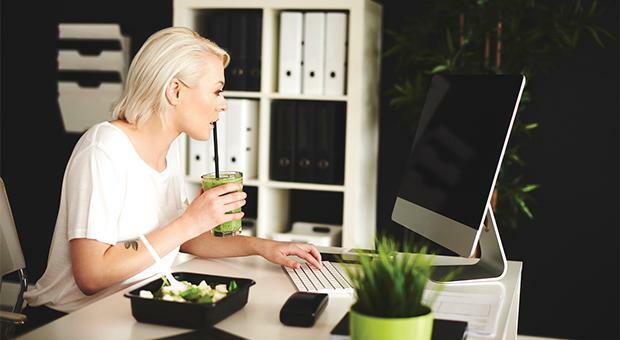 When you are in college or working in the office nine-to-five, preparing an exciting, healthy lunch can be a real challenge. According to a new study on the diets of 19 European countries led by the University of São Paulo, Irish people have the third worst diets in Europe. Almost half of the food we buy (45.9pc) is ultra-processed (for example, ready-made meals, sugary cereals and pastries). This does not surprise me. As a busy journalist, there have often been mornings that I have left the house in a rush to get into the office early. As a result, I would grab a croissant and coffee on-the-go, to substitute for missing my breakfast at home. Not to mention, come lunchtime, I would choose a ready-made meal from the supermarket – whatever was the handiest to eat at my desk, regardless of its salt and fat content. I have become much more conscious of how important making the correct food choices are. Not just for keeping our energy levels up throughout the day, but also for our health in the long-term. “The phrase ‘you are what you eat’ rings true," says Sarah Keogh, John West Consulting Dietitian & Nutritionist. "The food we take in becomes our skin, muscles, bones and brains – and so what we eat is an essential part of our health, both now and into the future. Food is also one of the places where people can really take control of their health. “Basic healthy eating hasn’t changed in many years – we still need lots of fibre and plenty of fruit and vegetables, and too much fat is still bad for us. However, almost 80pc of adults don’t eat enough fibre, which helps to keep our digestive systems working well. We need to eat 24-35g of fibre per day, but most people rarely eat more than 14g. Sarah says some of the best sources of fibre are oats, lentils and beans and she recommends having fibre-rich food at each meal. “Busy professionals and college students need plenty of fuel to keep energy levels up,” continues Sarah. “Following a balanced diet and getting the recommended intake of certain important nutrients, such as vitamins, high-fibre carbohydrates, iron, calcium, protein and healthy fats, is vital. Fish is a natural source of protein and Omega-3 fatty acids, and Sarah advises including fish in the diet at least twice a week. This should be alongside other recommended food groups on the Food Pyramid, which will help you to get the right balance of nutritious foods in the diet. I love eating fish dishes, but in the past have found myself not eating as much as I should, often due to a lack of time. There was also the worry that, after opening fish products, they would quickly go out-of-date. However, when I heard about the new John West No Drain Tuna Fridgepot, I put the product to the test. 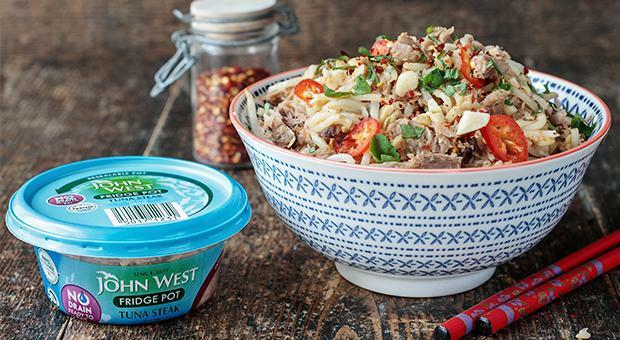 The John West No Drain Tuna Fridgepot is a fresh, innovative take on their traditional No Drain Tuna, moving No Drain Tuna out of the can, and into a modern, resealable, see-through pot. The Fridgepot can be resealed and kept in the fridge for two days once opened. This meant that when I brought the Fridgepot into the office, I was able to store it in the fridge at work and finish it the following day. And if like me, you don’t have a huge amount of time to do a big lunch preparation the night before, the best thing about the Fridgepot is that you can easily mix the tuna with some ingredients while in the office. For example, by mixing the tuna with low-fat mayonnaise and sweetcorn and adding it into a salad bowl with avocado, lettuce, peppers and some hazelnuts. Or, simply using the mixture as a sandwich filler. This is without the need to drain the tuna liquid from the product, therefore avoiding any excess juice in your sandwich (or spilled on the table). I was impressed! The No Drain Fridgepot is just as handy for parents of young kids. The fact that you can reseal it and keep it in the fridge for two days is perfect for mums or dads preparing tuna sandwiches for lunch. There are plenty of other simple and exciting ways you can make tuna-inspired cuisine fun and exciting. The No Drain Tuna Fridgepot is great mixed into a low-fat creamy pasta and pesto dish, and you could have this cold for lunch or in a hot dinner in the evening. For college students and work professionals alike, some creative dishes for dinner include: tuna and olive pasta; lemon rice with tuna and spinach; tuna patties; or tuna jacket potatoes with other fillings of your choice. 1. Place the rice noodles in a large bowl and pour over enough warm water to cover. Leave to soak for 15-20 minutes or until soft, then drain well. 2. In a small bowl, mix the tamarind paste with a splash of hot water. Stir in the fish sauce and brown sugar. 3. Heat the oil in a wok or large pan over a medium-high heat. When hot, cook the garlic and shallots for 30 seconds. Add the chilli flakes and drained noodles to the wok and cook for 2-3 minutes, then push to one side. 4. Add the eggs to the pan and allow to set, then scramble and stir through the noodles. 5. Add the tamarind mixture and stir to combine well. Add the tuna, bean sprouts, spring onions and half of the peanuts. Toss well and cook for 3-4 minutes longer. 6. Divide among four serving bowls. Sprinkle with the fresh coriander and the remaining peanuts and serve with some lime wedges for squeezing over. 1. 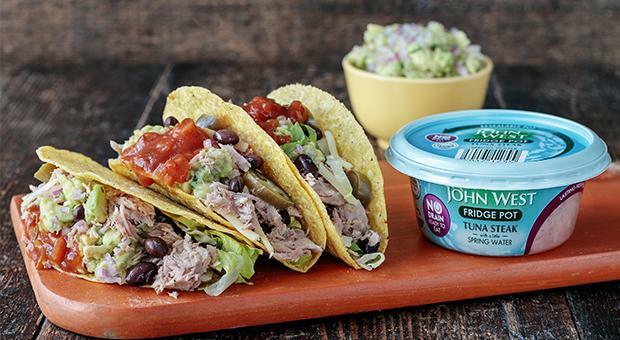 Fill the taco shells with the lettuce, black beans, cheese, tuna and pickled japaleños. Squeeze over some lime juice and top with a bit of salsa. 2. Combine all the ingredients for the guacamole. Season with salt and pepper to taste. Dollop on top of the salsa and serve immediately. 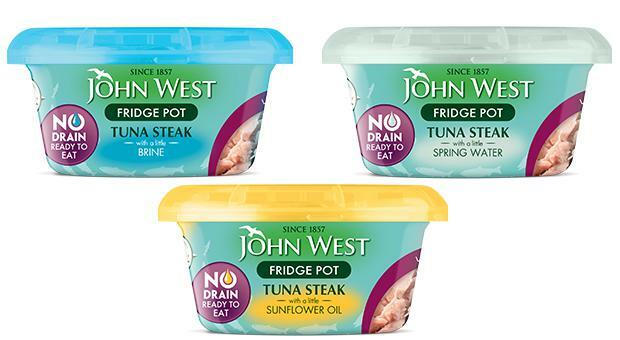 The new John West No Drain Fridgepot is currently available in a 110g format and comes in three variants: brine, sunflower oil and springwater, with a fourth – olive oil – coming soon. For more inspiring recipes, check out the John West Ireland website or YouTube channel.